Our Macs are powerful machines, but few of us know how to use them to their full potential. From editing photos to helping you stay on top of your daily to-dos, your Mac can help you with a host of different tasks—if you're using the right apps. Of course, not all of us have the time to deep dive into the App Store to find the ones that are worthwhile. The 2018 Mac Essentials Bundle saves you some of the legwork by bundling together 10 of the best apps out there, and they're all available for over 90 percent off. BusyCal 3 goes far and above what the standard calendar app can do, providing you with loads of time-saving features while integrating with all the leading cloud services, including iCloud, Google, Exchange, and more. Rated 4/5 stars by VPN Mentor, Cargo VPN lets you encrypt your internet connection to keep the websites you visit, your IP address, your location, and your personal communications absolutely private. This powerful desktop search tool uses Spotlight index to mine into files to find lost documents. With a huge array of customizable search criteria and a deeply organized interface, you can find and filter results at rapid speeds. uBar is a dock replacement that can be set up as a dock or a taskbar and delivers a host of tab grouping options, window previews, in-dock reminders, and many more features. This app finds true duplicate files on your Mac, even if they’re named differently. It removes duplicates from apps, including iTunes, and even bulk deletes duplicates in Photo or iPhoto to ensure your Mac is running at peak performance. RollerCoaster Tycoon 3 Platinum is the all-time classic game that lets you build your own theme park from the ground up, and in the Platinum version, you get the original game along with the expansion packs, Soaked! and Wild! for added gameplay. This powerful program detects and quarantines any unwanted or malicious programs automatically on your Mac and alerts you so you can clean it up fast and keep your Mac operating free of malware. Concealer hides and encrypts sensitive files and passwords on your Mac by storing information in the form of cards. It uses AES-256 encryption to protect whatever it is you need, while still giving you complete, secure access to your information. Movavi's clear interface, automatic quality improvements, and smart selection options make photo processing an intuitive experience. You can experiment with backgrounds, delete unwanted objects, apply digital makeup, add filters and textures, tweak parameters using color-coded sliders, straighten, crop and flip frames, and all with just a few clicks. Ideal for designers and publishers, Flip PDF is a powerful tool that allows users to easily convert ordinary PDF files into mobile-friendly digital flipbooks. You can create e-books, digital brochure, product catalogs and more and customize them with a staggering number of themes and templates. 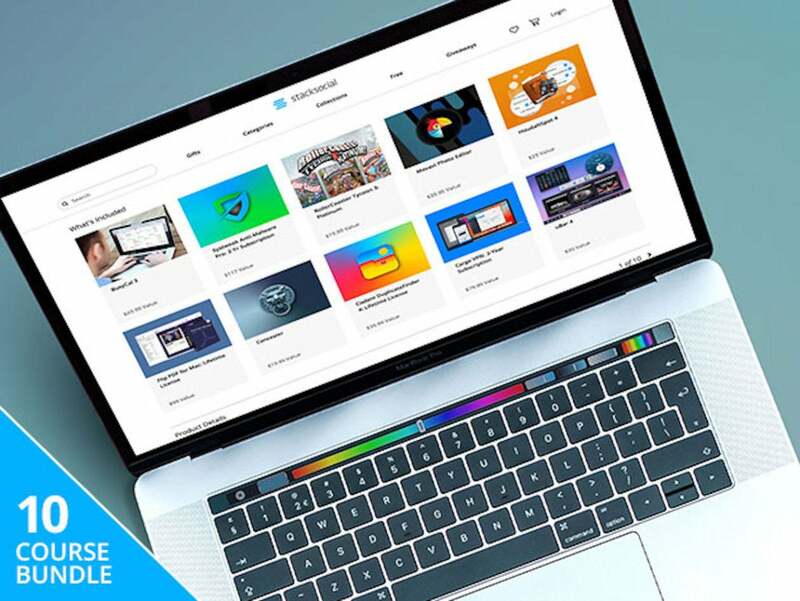 The 2018 Mac Essentials Bundle is available today for $19.99, more than 90% off the usual retail price.